They need to look a little harder – limits are closer than they realize. but his approval rating is now down to 18%… ! can he be ousted by a recall vote under French law? Russia instead of China. Interesting! They are making the bet. Maduro was to gone years ago, if you are reading Wester Media. Obviously, somebody is getting bad media. China got “burned” on their deals with Venezuela. 5 billion is not large of bet for Russia. I read that Russia thinks that Venezuela will produce 10 million bbl per day in the coming future. If so, anything approaching 10mbd is huge and would drive down oil price. “The Food and Agriculture Organization’s (FAO) food price index, which measures monthly changes for a basket of cereals, oilseeds, dairy products, meat and sugar, averaged 160.8 points last month, down from a revised 162.9 in October, and its lowest level since May 2016…. “The U.N. body’s Cereal Price Index averaged almost 164 points in November, down 1.1 percent from October. Vegetable oil prices fell for a 10th consecutive month, by 7.6 percent on the month and reaching a 12-year low. “Cereal prices fell partly because new crops weighed on rice export quotations and export competition drove down maize, FAO said. “Oil refiners’ profits in Asia have slumped to the lowest in more than four years… Oil inventories are building as new refineries in China and Vietnam are running at full tilt, adding to Asia’s supplies. “Factory activity and export orders weakened in November, prompting analysts to predict no quick rebound amid persistent trade tensions. “The margins are also the lowest for this time of the year since 2008, the data showed. “Refiners now face losses of more than $1 a barrel for every barrel of gasoline they produced. “Several oil tankers are storing gasoil off Taiwan… KY Lin, a spokesman at Formosa Petrochemical Corp, one of the largest fuel exporters in Asia, is hopeful that the recent drop in oil prices could boost demand. 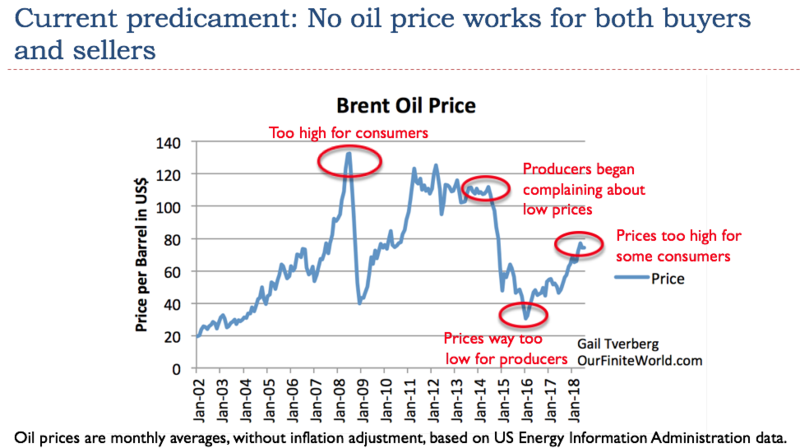 If the glut is in light oil, it could indirectly reduce that amount that refiners are willing to pay for US tight oil from shale (differential to Brent or WTI). This is what cuts back production from shale, as much as drop in WTI price. I t takes at least 30 years to break even on new refinery production. That is why the US has very little ability to refine this light stuff. 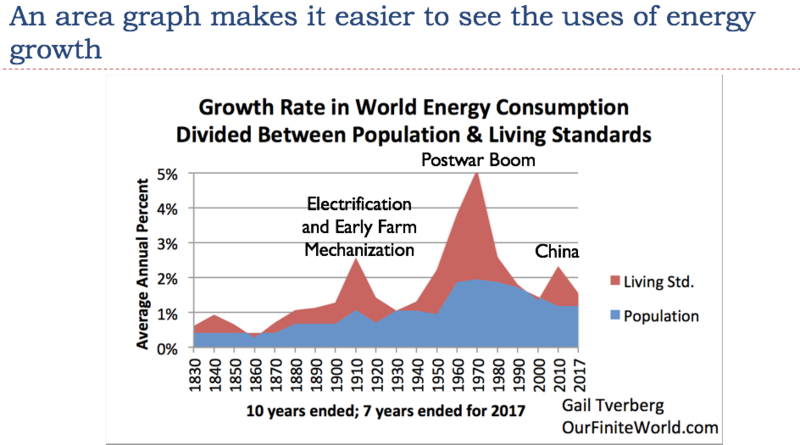 All energy prices, including food, tend to move together. “Wherever Mark Connors looks at markets, from stocks to currencies to oil, he sees signs of the unknown. 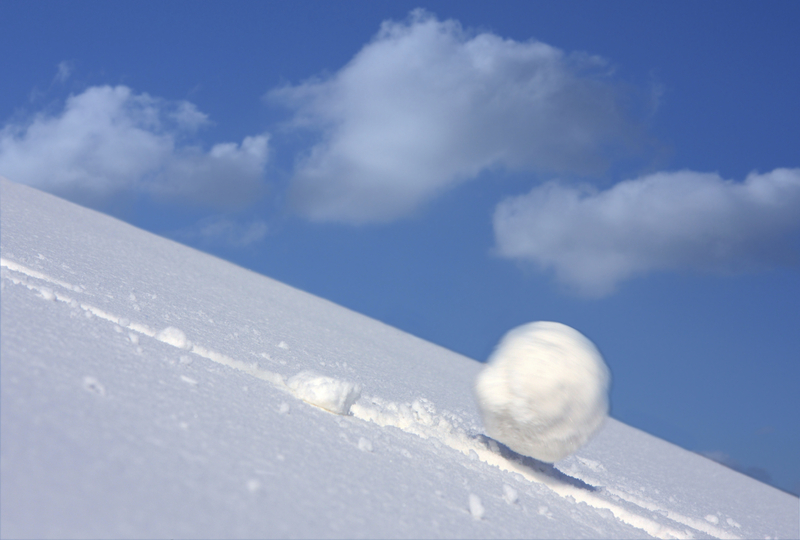 “Equity investors got whipsawed this week during two rough and volatile sessions, but Connors, global head of risk advisory at Credit Suisse, had seen worrying signs long before that. A key technical measure he tracks, the correlation between the price of stocks and currencies, had broken down starting in April. 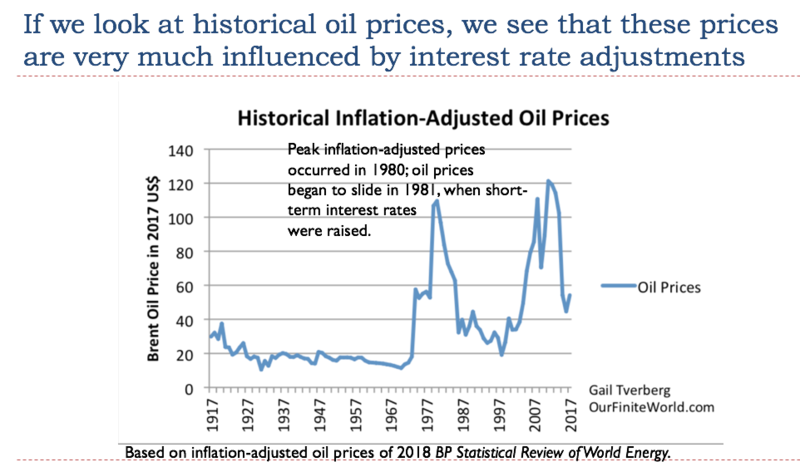 That, along with sharp drops in the price of oil, point to one thing, he says: Uncertainty about the future as central banks around the world unwind programs that bought trillions of dollars of assets. “The unwinding of central banks’ programs a decade after the financial crisis brought economies to the brink is known as quantitative tightening. J.P. Morgan Chase CEO Jamie Dimon said in July that one of his biggest fears is around how markets would behave as central banks removed their unprecedented stimulus. “As a longtime market observer, what I find most interesting about the latest correction in equities has the feeling of inevitability that it will turn into something worse. It wasn’t this way in late January, when everyone wanted to buy that dip. It certainly wasn’t this way in 2007, when the magnitude of the recession was grossly underestimated. “Only a globally co-ordinated debt “bonfire” can save the world’s leading economies from depression now that monetary and fiscal armouries are exhausted, a leading economics consultancy has warned. Perhaps someone should look at history. A global co-ordinated debt “bonfire” is equivalent to a debt bubble collapse. It is what is the proximate cause of collapses. Of course, the underlying cost is too little energy consumption per capita. This, in turn, is related to too high cost (to low average EROEI) of energy products. A lot of “value” doesn’t really have anyone on the other side. These aren’t really debt, but they act like debt. The government promises (sort of) to pay you Social Security and Medicare (or retirement and health coverage in other countries). These aren’t guaranteed. They aren’t considered debt. A company or person owns shares of stock. The person owning it thinks it can be sold, and the proceeds used to buy things of equivalent value. 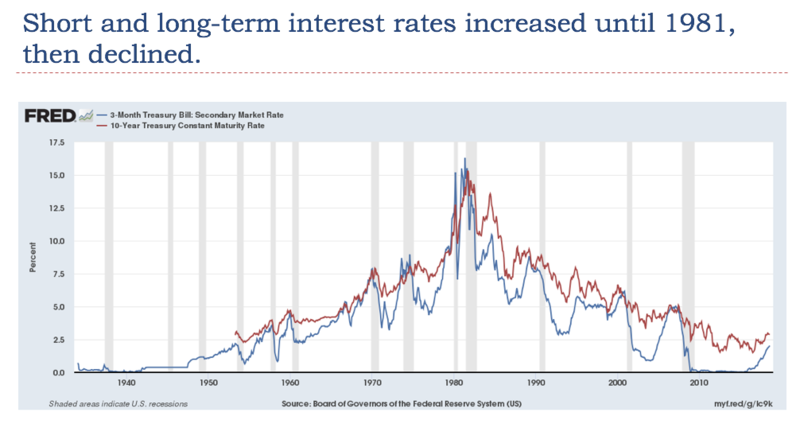 If debt defaults happen (even if not related to this particular stock), prices of stock will drop dramatically, making them impossible to sell for a reasonable amount. A similar problem arises with the price of homes, and farmland, and mines. The prices will drop, and it will be impossible to get anything of value for them. 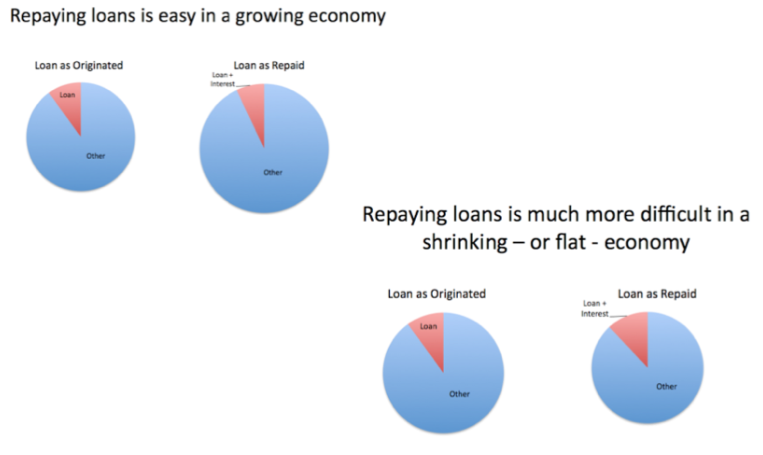 This isn’t a debt default directly, but it happens when debts get wiped out by defaults. I don’t know of any other way to wipe out debts. A person wonders what the buy-sell programs for stocks and bonds will do, when the program figures out that the world is headed into a major recession. Why are there so many destabilizing events going on now ? Perhaps because standards of behavior are not very high today. There really is a lot of impropriety going on, because normal “return on investment” is close to zero. It is only with impropriety that a person can support himself/herself. WTI seems to be at $53.79. Did it take this long for the big draw on US oil stocks to hit market prices? There is some wiggle room. WTI is a different game sometimes, being smaller and US centric. The markets seem to like this, even though it is less than the 1.3m barrels p/d I was under the impression was considered desirable. “OPEC finally broke an impasse over production curbs, agreeing on a larger-than-expected cut with allies after two days of fractious negotiations in Vienna. “The cartel and its partners agreed to remove 1.2 million barrels a day from the market, with OPEC itself shouldering 800,000 barrels of the burden. Iran emerged as a winner from the contentious talks, saying it’s secured an exemption from cuts as it suffers the effects of U.S. sanctions. I didn’t see this comment, when I made my earlier remark to Duncan. 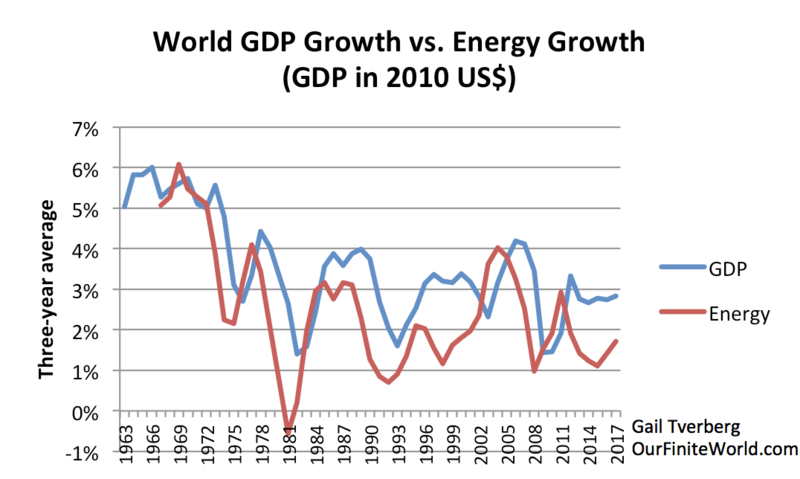 Lower production agreement could be the start of downturn in world oil supply, when coupled with low oil prices. I hadn’t thought of it in those terms. 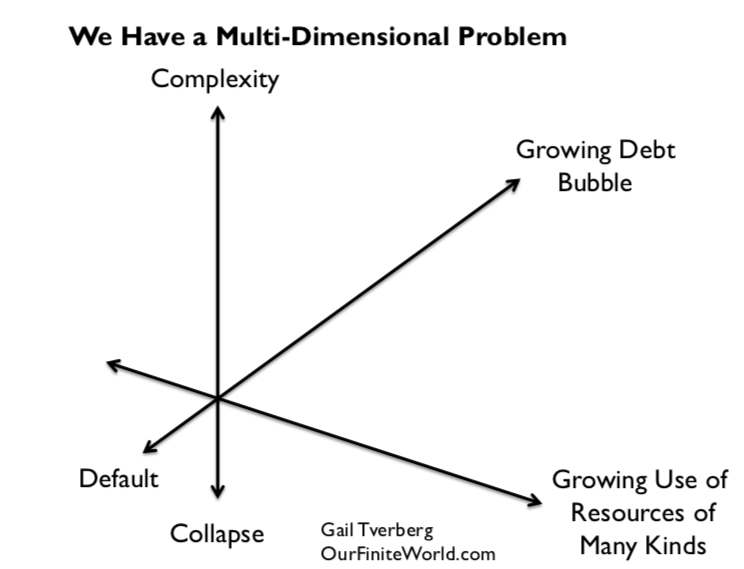 Perhaps we are about to pass peak supply – a very sobering thought! We shall see how the market responds. 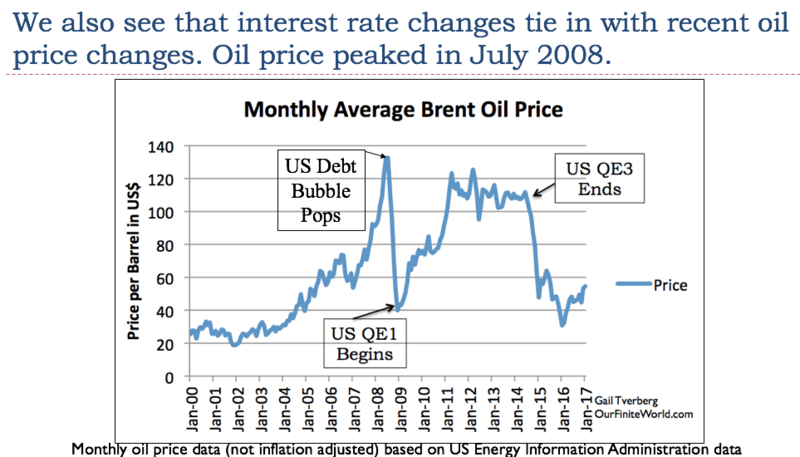 We’ve discussed how oil price faces downward pressure from financially strapped non-elite consumers, but not so much about a consortium like OPEC constricting supply to force a higher oil price, and they can since they provide approx. 34 mbd. 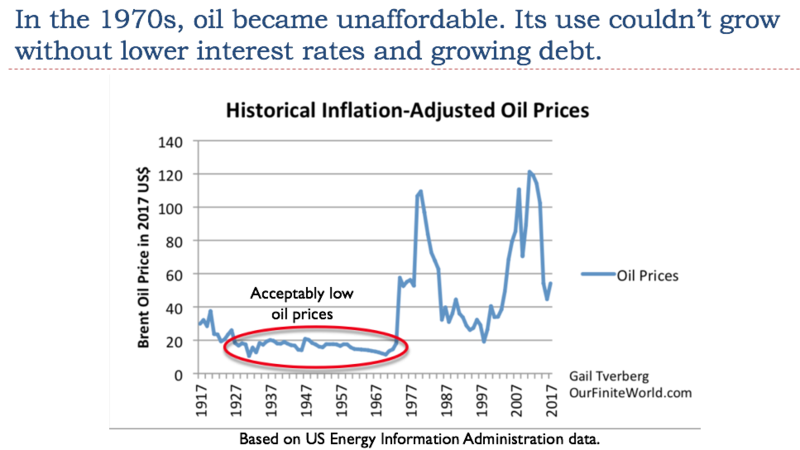 That’s a sizable enough supply to effect great control on oil price. However, less volume sold is also less money, so rising price will only work if the consumer can pay it. 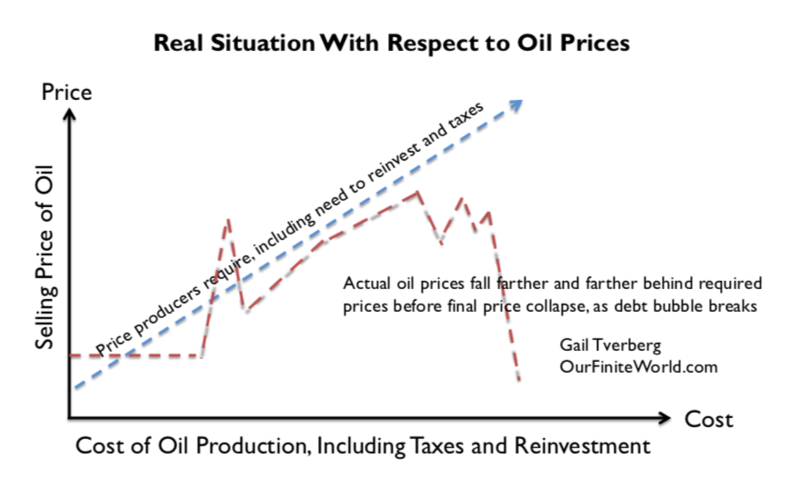 Allow me to clarify; Less volume sold is less money because it’s fewer barrels sold, but if a higher price can be sustained it could make more money overall, so there is a trade off between higher price and lower volume and we’ll see how much the non elite consumer can help OPEC sustain more money from sales, but we can see again how pressured these government run businesses are to bring in more loot. So how can you conclude that consumption per capita is falling ? Maybe I need to look at this more closely, when year end energy data by type of fuel becomes available. The chart shows that between 2010 And 2017, emissions rose by 1.0% per year. This is less than world population growth during this time. 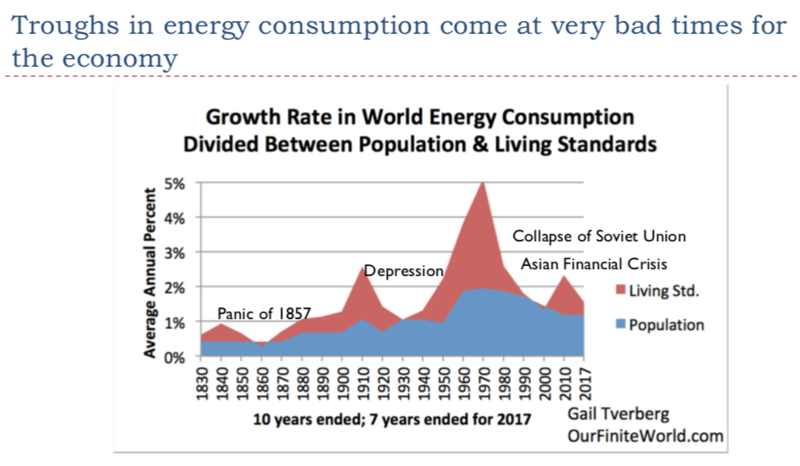 Thus, for this period, (which is long enough to cause a major problem), energy consumption per capita doesn’t seem to be up very much. In order to prevent collapse, we need a higher increase in energy consumption. In fact, a 2.7% increase in emissions would be appropriate with such an increase. By historical standards, this is still pretty low. It may have kept us away from collapse this year. Ok for this year. I’m afraid that it’s beginning in France : low wages, high taxes. No Growth. No more growth in the future but increase of population. As you write : next year, it’ll be interesting. Do I have to buy a gun ? Here a lot of people shout ‘Macron get out’. No democracy now. We are on the edge of a changing world. See Jared Diamond. maybe your leadership made a big mistake by letting in so many immigrants? why? don’t all the people in France get along well with each other? 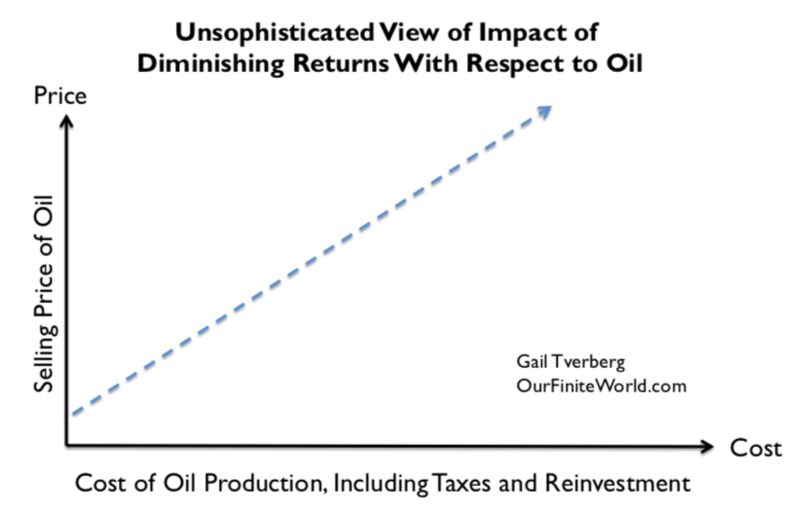 when cheap surplus oil is available—everybody can have what they want, as much as they want. this applies to all industrialised nations—not just France. The EU came together in a time of mutual prosperity—as that prosperity goes away–the EU will revert to more traditional methods of diplomacy. French people were given handouts, just like the Greeks and Italians. And the rest of the EU. Very few people know where those handouts came from. They still want to retire at 55, get free med care and free everything else, but demand an end to taxation. great!! they remain convinced that they were a fundamental, permanent right. As I’ve said before, people get violent when those rights are taken away—there remains that weird certainty that governments are there to deliver free money. What we are seeing in France is what will happen in the USA as Trump’s promises fail to materialise and they vapourise. But on a vastly bigger scale of course. China is doing the same thing, maybe a bit differently. so productivity per capita falls, and will continue to fall as that oil production % rises. we won’t get there, because denialists and conspiracy theorists will blame everyone and everything for chaos, unable/unwilling to comprehend the real reason. The catch is that the energy isn’t really oil, used to extract oil. It is generally, other, cheaper forms of energy. So the ratio tells you much less than you think it does. Increasingly, natural gas is being used to extract oil. Or electricity made from coal.